A pet sitting business is a great way to enter the animal industry. As the owner of the business, you are free to set your schedule, define your service area, and expand your business to include additional options for clients. Many pet sitters are required to register for a business license before accepting clients. Make sure to find out what is required by contacting your local city hall or business advisory group. Most pet sitters operate their businesses as either sole proprietorships or limited liability companies (LLCs). Sole proprietorships are businesses formed by one individual whose personal and business assets are not separated; the owner is responsible for all business debts. An LLC separates personal and business assets; this makes the business owner not personally liable for the debts of the business. It would be advantageous to consult an accountant while setting up your business if you do not have previous experience with the process. Insurance is available for pet sitters. A policy will protect you from potential legal action if a pet should cause damage or gets hurt while under your supervision. The cost is only a few hundred dollars and could save you a legal headache down the road. There are many companies offering this service, such as Pet Sitters Associates LLC and Pet Sitter Insurance. Design a flyer and business card to place on entryway bulletin boards in vet clinics, supermarkets, dog groomers, and pet stores. Leave several business cards or flyers if possible so potential clients will feel free to take one with them for future reference. You can also place ads on Craigslist, in church bulletins, and in neighborhood newsletters. Consider having your contact information and logo made into large magnets to display on your vehicle. Create a website with a personalized domain name and detailed information about the services you provide. You can also advertise while you work by wearing clothing customized with your business logo and phone number. Word of mouth will generate much of your business. When clients come to you, make a note of where they heard about your service (referral from a friend, website, flyer), so you will know what areas to focus on. For each owner who uses your pet sitting service, maintain a contact sheet that includes their address, phone number, email, and emergency contact numbers. Be sure to record complete information on each pet including breed, color, date of birth, health history (allergies, previous injuries), veterinarian’s name and clinic contact information. For repeat clients, make sure to ask if there are any updates or changes to what you have on file for the pet. You should also include a daily care sheet for the owners to fill out. It should detail the pet’s feeding, medication, and exercise schedules. Make sure to leave a space for any special instructions. A basic veterinary release form will allow you to take the pet to the vet with the owner agreeing to pay any resulting bills. It is very important to discuss a veterinary contingency plan with the owners prior to their departure, as they may be unreachable at their vacation destination. Make sure everything is in writing. Most pet sitters charge for their services based on number of visits required per day. Additional options such as grooming, obedience training, or pooper scooper service may also be offered for a fee. House sitting services such as watering plants and collecting mail may also be negotiated for a fee or offered free as an extra perk of using your service. The best way to get a feel for pricing is to check out the local competition to see what the going rate is for pet sitting services in your area. You should also call vet clinics and boarding facilities to see what they charge. 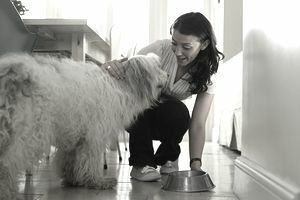 Owners often prefer to keep their pet in a familiar home environment rather than expose them to the more stressful boarding situation. If your costs are competitive, you should have an edge with in-home service. Terms of service agreements spell out in detail the relationship between the client (pet owner) and service provider (you). It is the place to outline exactly what your service offers, pricing, payment options, cancellation policies, damages, veterinary situations, etc. Make sure you have a signature before you begin work for a new client. Always remember, word of mouth is your best advertisement. Doing a great job for one client can lead to a dozen referrals.